Escape to the Cornish coast and stay right on the famed Fistral Beach in a dramatically beautiful location. 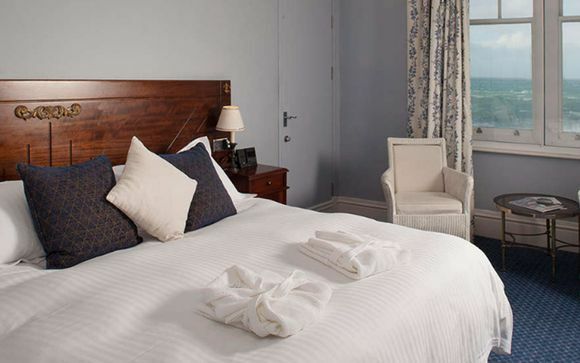 Settle in to your room or cottage and delve into the majestic grandeur of The Headland Hotel, an award-winning property that blends English elegance and luxury. 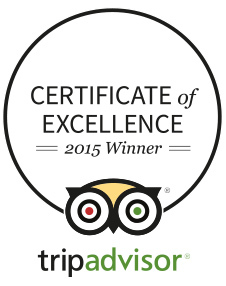 Dine at the two rosette-awarded restaurant Samphire (where members get £10 off!) 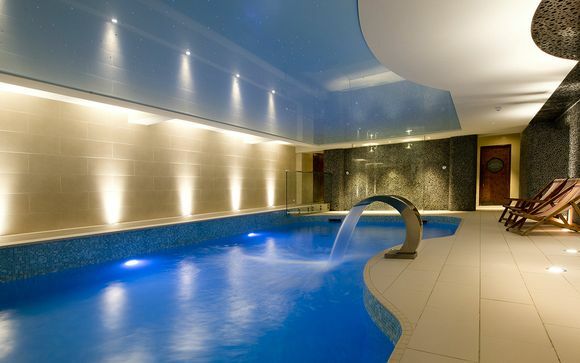 and indulge in sumptuous spa days at Cornwall's first Five Bubble awarded spa - both housed in your hotel. Whatever the season, there is so much to see and do in stunning Cornwall! On land there are fabulous markets to seek out unique treasures and local delicacies; inspiring and intriguing walks with monuments, mines and castles; sub-tropical gardens with rare beauties; and horse-riding Poldark style if it takes your fancy. By the coast stumble upon secret beaches and picturesque fishing villages; watch the boats bob or the waves crash; tuck into the freshest local seafood or watch a game of Polo on the beach with a glass of Champagne in hand. 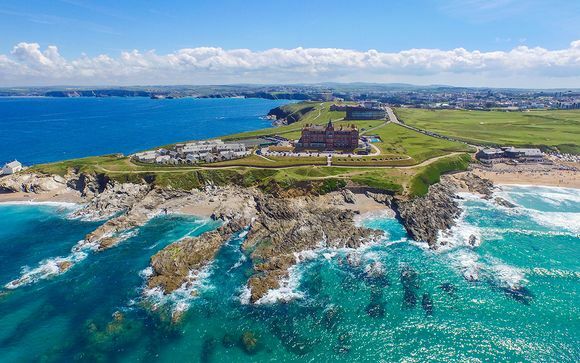 Majestically placed on a rugged cliff overlooking Fistral Beach, The Headland Hotel is encircled by the gleaming Cornish Coast in all its breathtaking glory. The famous beach boasts some of the best surf spots around, with impressive 4-12ft swells gracing the shoreline. Newquay alone can keep you occupied for days with its gorgeous beaches, fine dining, nightlife and boutiques. Amble into town, rent a surfboard or go on a fishing trip. Beyond the beach, there are multiple attractions and miles of charming walking routes. If you recognise the picture-perfect aesthetics of The Headland Hotel, that’s probably because it found fame on the big screen in Roald Dahl’s ‘The Witches.’ A regal building with a red brick façade shrouded with Victorian splendour, the interiors exude a homely feel with its roaring fires, plush sofas, resident pups and exquisite amenities. Fusing subtle English elegance and award-winning luxury, the hotel houses a rosette-worthy dining experience by Executive Chef Christopher Archambault alongside indulgent pampering and wellness at its Five Bubble-awarded spa. "A grand, hulking Victorian pile on a headland in Newquay – famed for its starring role in the film of Roald Dahl’s The Witches – offering good food, cosy cottages and spectacular views of Fistral Beach." Members may choose to stay in a room or a cottage. Rooms: Ocean View Room, a Coastal View Room or a Courtyard Room. Offering all the creature comforts you’d expect, these thoughtfully-designed rooms whisper peaceful slumber. From Victorian and traditional to chic and contemporary, all are light, bright and exceptionally lovely. Oh, and the Atlantic sea-views, they are well worth throwing open the curtains for! 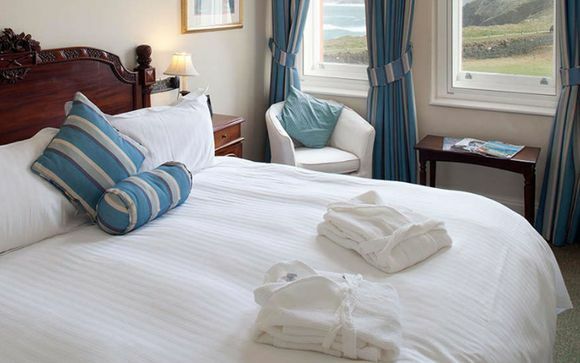 Traditional luxury at its best, these comfortable bedrooms have views right across the coastline, and towards Trevose Lighthouse. Coastal View bedrooms are a very popular choice, especially if you would like a fresh, contemporary room, with far-reaching views, at a very respectable price. Built for lazy lie-ins, these bedrooms are excellent value. They don’t have any external views but, for what they lack in outlook, they make up for with cosiness. They are the perfect choice if you are seeking the simple pleasure of an unfussy bedroom, where you can snuggle-up safe and sound, out of the earshot of the roaring storms above. 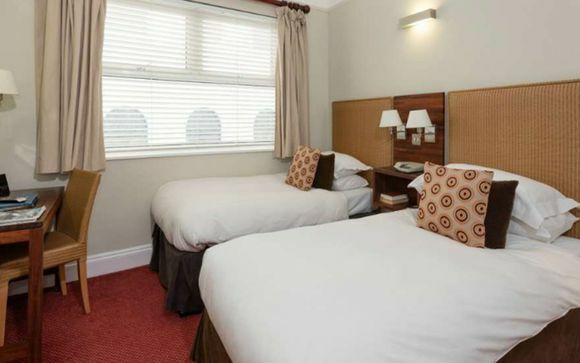 These bedrooms are typically made-up in a twin-bedded configuration, but double and triple-bedded Courtyard Rooms are available. You may choose between a One Bedroom Cottage, Two Bedroom Cottage or Three Bedroom Cottage. Nestled on an intimate hilltop, the award-winning self-catering cottages are just steps away from the UK’s most celebrated beach. The epitome of relaxed coastal lifestyle; you can come and go any day of the week and live as you please. As a guest of The Headland, you will also enjoy unlimited use of the hotel's amenities including the award-winning Headland Spa leisure facilities, heated outdoor swimming pool (when open), mini football field and putting green. Each self-catering cottage receives a light daily clean, and will be kitted out with every convenience; the hotel will even assist you with your shopping and can arrange for seasonal and fresh farm produce to be delivered direct to your door! 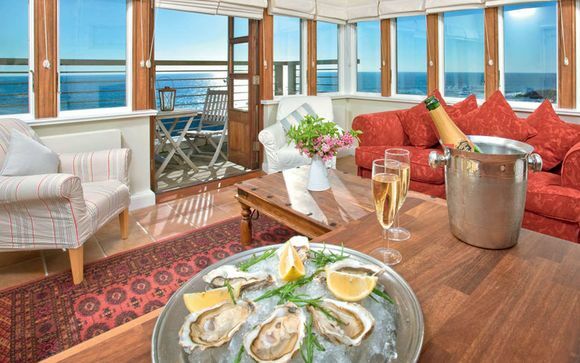 Escape to the coast and indulge in an unforgettable romantic break just for the two of you. Deceptively spacious, these coastal cottages feature king-size four-poster beds, double-ended baths, and a crisp, contemporary open-plan living area with log-effect gas fire. Most offer sea-views and outdoor spaces such as a deck, balcony or lawn. Travelling as a new family? Request a cottage with a cot, there’s plenty of space for your little one. 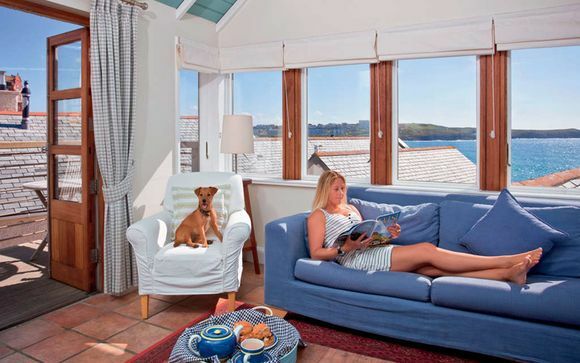 With many of these cottages located on the outer edge of the village, they enjoy some of the finest sea-views – ‘Mariners 2’ offers a panoramic 270° seascape from its living space on the lofty fourth floor. Others may have restricted views, but offer lovely, sheltered outdoor living spaces and exceptional value. The master bedroom features a king-size four-poster bed, with an en-suite complete with double-ended bath, whilst the second bedroom is an en-suite twin-bedded room. 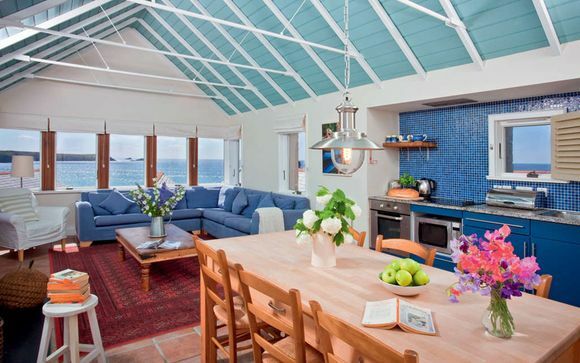 These spacious shoreside cottages are designed with families and friends in mind. The large open plan kitchen and living area keeps everyone in range whilst offering ample room to relax, making this the coastal home you’ve always dreamed of. Cool and self-contained, they offer en-suite bedrooms, private decks and large living areas with super-soft sofas, entertainment systems and log-effect gas fires. Most of these cottages come equipped with a cot and an extra pull-out bed, too. The master bedroom features a king-size four-poster bed, while the additional bedrooms are en-suite twin rooms. £10.00 voucher towards food and beverage in the hotel during the stay, given to our guests on arrival. Option to purchase a three course dinner on arrival at a discounted rate of £30 per person per night instead of the full price of £35 pp. Samphire: Named after the delicious sea vegetable that grows on the rocky shoreline, this two-rosette awarded restaurant boasts Executive Chef Christopher Archambault at the helm. The result is vibrant, Cornish coastline-inspired fare in a timeless setting with an unforgettable view. The Terrace: Located steps from the famous sands of Fistral Beach, the laid-back Terrace Restaurant offers a gorgeous oceanfront dining experience and serves classic favourites alongside special cocktails. Nestled in the beating heart of the hotel, guests will find the entrance to a sublime paradise in the form of The Headland Spa. One of Cornwall’s best kept secrets, the spa is the first in the county to achieve a ‘Five Bubble’ rating for its dedication to balance, pampering and wellbeing. The Spa Lounge offers scenic views of the coast, whilst the luxurious relaxation suites and dimmed treatment rooms create a calming sense of tranquillity and intimacy. Why not opt for an indulgent massage alongside your partner in the romantic couple’s suite? Directions to the hotel: Travelling by road to The Headland in Newquay is straightforward. Travel down the M5 to the end of the motorway at Junction 31, and choose the A30 or the more southerly A38 (which has some single carriageway sections and traverses the Tamar Bridge at Plymouth). Both routes rejoin at the Bodmin by-pass. From the outskirts of Newquay follow the signs to Fistral Beach. Parking is available on site at The Headland.